By all accounts, the Coombs Farmers’ Institute ‘Farmers Feed Families’ event, held at the Coombs Fall Fair Aug. 8-9, was a smashing success. The Arrowsmith Agricultural Association Fair board was grateful to have a large, colourful, well-decorated and interactive agricultural venue fill a third of their Recreational Building, helping to fulfill their vision of a true country fair. Five CFI member farmers hosted tables: Sharon and Sam Pickard of Grin Sheep and Pickard Farm; Trish and Kim Mauriks of Northwest Bay Ranch; Stephen and Fiona Thiessen of Shiloh Forest Farm; Colin, Diane and Ross Springford of Springford Farms; and Nicole Shaw and Dirk Becker of Transfarmation. 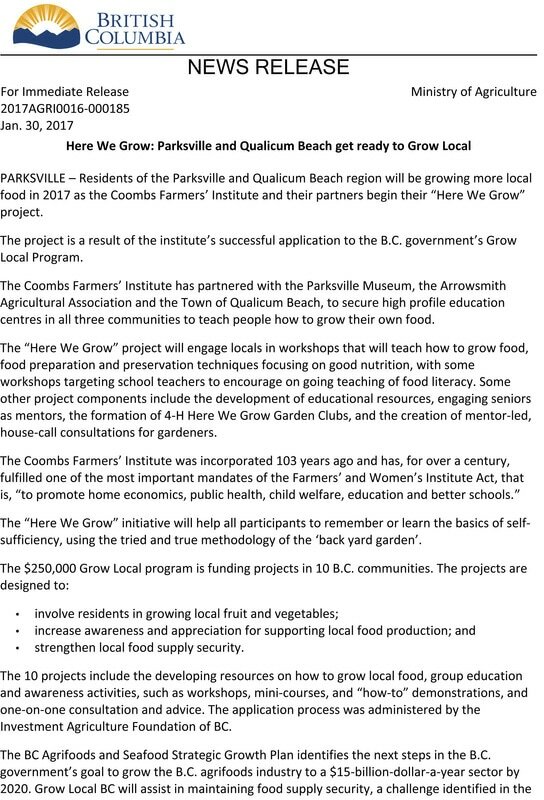 Five partner associations also hosted tables: the Vancouver Island Goat Association; the Errington Farmers Market; the Qualicum Beach Farmers Market; the Qualicum Beach Community Education and Wellness Society and the ’Root Bag Project’; and the Salish Sea Culinary Guild. Event participants put in long hours, building and painting props, preparing and decorating the floor space, setting up and attractively arranging their own tables and, finally, helping with the clean-up and tear-down. Their enthusiastic engagement of the public brought the spirit of the event to life, that is, the important and vital discussion about food safety and sustainability. 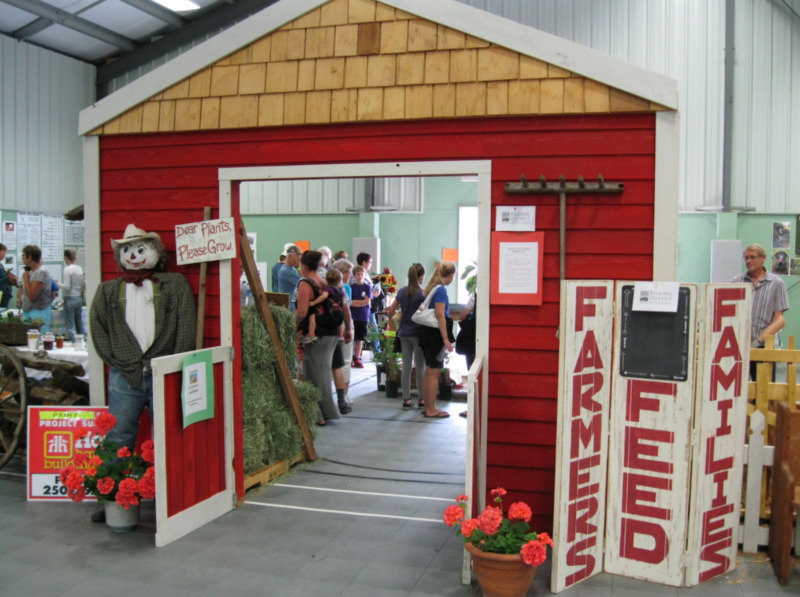 Farm owners had a perfect opportunity to showcase their products, which included beef, goats, sheep, poultry, ducks, seafood, vegetables, fruits and fibre arts. One-on-one conversations provided for building new market opportunities while helping the consuming public to understand the importance of knowing their food provenance. Pictured: District 'A' Farmers' Institute June 22, 2015 Meeting with the Deputy Minister (Derek Sturko) and Assistant Deputy Minister (James Mack) Delegation Members Blaine Hardie, President, Janet Thony, Vice President, Cathy Burkosky, Secretary and Mayta Ryn. 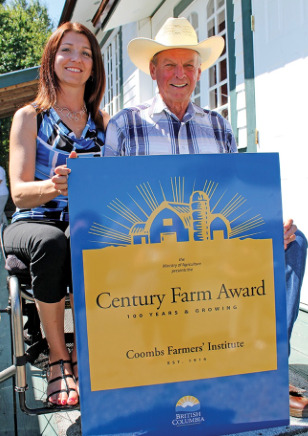 The Coombs Farmers' Institute received a Century Farm Award from the province last week to mark the group's 100th anniversary. Brought together in February 1914, the Coombs Farmers' Institute started as a small group of producers dedicated to supporting and fostering local agriculture.